Tyred and Exhausted are an independent, family run business providing a first-class service and competitive prices. Their aim is simple - to become the first-choice motoring centre for everyone in Aylesbury area. 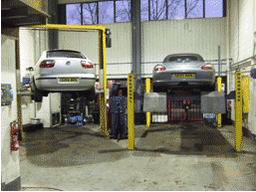 Their highly experienced technicians are a fully and trained team â€" so you know your pride and joy is in safe hands. Their depth of knowledge and wide range of expertise means they can carry out any job from changing your battery to a fitting a new clutch quickly and efficiently â€" often while you wait (or pop across the road of Tescoâ€™s!). They always make customers welcome, and they give you the best advice in simple English (no jargon!). Their team look forward to meeting you and hope that their high standard of service and quality of workmanship will keep you coming back for all your motoring needs. Opening hours are 8-6 mon-fri and 8-1 sat. For further information or if you have any queries, contact the number above.